Sorry for the brief hiatus! I recently got married, and while I barely had any time to post here, I was still able to find time to read here and there in between everything else. I have a huge backlog of posts I need to write from my summer reads, so I’ll be getting to those soon! And there are some good ones in there! Before the wedding, I was contacted by an up-and-coming author named Lisa Lim, who asked me to read and review her book. When I read her description of the book, “Bridget Jones meets The Office”, I didn’t even think twice before I responded with an enthusiastic “Yes!” (in so many words). 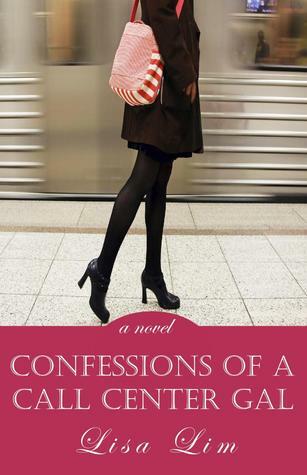 “Confessions of a Call Center Gal” is about a new college grad named Madison (aka Maddy), who is searching for her first real job out of school in a horrible job market. With no other options left in her hometown, Maddy decides to move to the midwest to be with her best friend, Karsynn (aka Kars), who is in the same jobless boat. Both girls apply to positions at a local call center and thankfully, both get the jobs. While neither girl aspires to be a call center service rep for a living, it’ll do for now. One bright spot for Maddy is her crush on her hunky Belgian coworker and new friend, Mika. She helps as his English tutor and their relationship starts to grow, even though Mika is already dating another one of their coworkers, who is also a friend of Maddy’s. While Maddy and Kars enjoy working together and the camaraderie with some of their coworkers, their boss is horrible and of course, there’s the whole issue of dealing with irate customers who blame you for all of their troubles, like you’re the one who personally messed up their service. I liked that Maddy and Kars seemed like normal girls leading a pretty normal life, instead of the glamorous New York PR-types of characters in most chick lit books (which I normally don’t mind, but it’s a refreshing change). Some of the situations that Maddy found herself in with her callers and coworkers made me chuckle. I admit I had a little bit of a hard time liking Kars, Maddy’s best friend but I think that’s just the way the character was written. And here’s a fun twist, Lisa Lim actually worked for a call center and I found myself wondering how much of the book was inspired by her own experiences! Overall, the book was an easy, fun girly read that will make you glad you don’t work in a call center (or if you do, I’m sure you’d identify with Maddy’s pain and suffering). This is author Lisa Lim’s first novel, and I hope she writes another (or more)! You can follow her updates on Goodreads, and if you’re looking for a new blogger to follow, check her out at Confessions of a Call Center Gal. She blogs about a variety of topics, including books and her love of Anthropologie clothing. She has some great fashion sense and the same taste in books as I do!